I keep bumping into this recipe on the food blogs I read. I've seen it posted on Epicurious, Steamy Kitchen, Smitten Kitchen, and Food.com. If you google "marcella hazan tomato sauce butter onion" you'll find a gazillion returns, because so many people have been raving about it. Is it worth all the hype? Yes, indeed, it is. 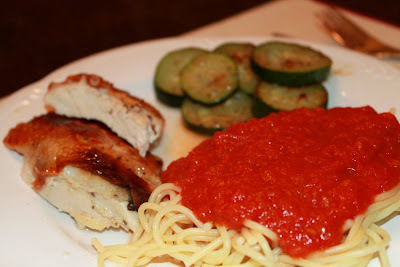 This sauce is amazing in its simplicity. No one can deny the appeal of a from-scratch recipe that uses only 3 ingredients (4, if you count salt) and almost no effort to make. The first thing you taste * is tomatoes. Then, you taste the butter. Oh, the butter. 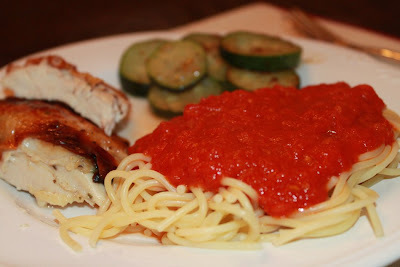 This sauce is buttery and tomatoey and just plain delicious. It's not fancy, nor do I want it to be. It's just a simple, really good, really easy sauce. 5 spoons in our house. * Unless you're like me and you shoveled a spoon of it into your mouth, while it was still steaming and burbling. Then you'll just have burnt-mouth and not really taste much of anything at all. 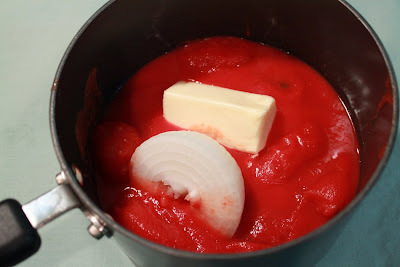 Put the tomatoes, onion and butter in a heavy saucepan (it fit just right in a 3-quart) over medium heat. Bring the sauce to a simmer, then lower the heat to keep the sauce at a slow, steady simmer for about 45 minutes, or until droplets of fat float free of the tomatoes. Stir occasionally, crushing the tomatoes against the side of the pot with a wooden spoon. 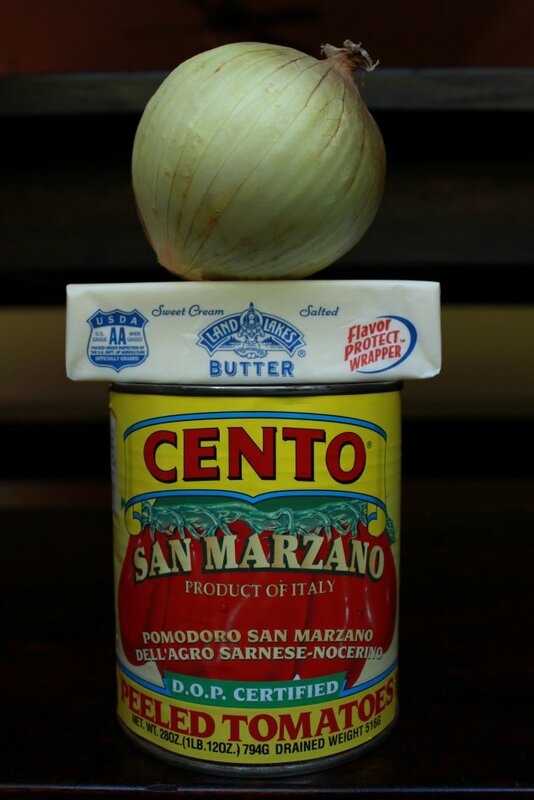 Remove from heat, discard the onion, and add salt to taste (you might find, as I did, that your tomatoes came salted and that you didn’t need to add more) and keep warm while you prepare your pasta. This looks way too easy. Mmm...that does sound good and easy! I have to put this one on the list to try.